___(c) a detailed provision concerning artificial islands (see below). The greatest impact comes from the sovereign rights of the coastal state to explore and exploit all living and non-living resources, from the subsoil to the wind. However, the interests of other states are of no lesser significance, particularly with regard to navigation. Part V therefore includes provisions for the freedom of navigation and overflight, for the laying of submarine cables and pipelines, and other lawful uses of the sea related to these freedoms. These freedoms can basically be exercised as on the high seas but always in a manner compatible with applicable provisions of the Convention and states must respect the coastal state's rights and duties when acting in its exclusive economic zone. Consequently, the exclusive economic zone has to be treated as an ocean area which "shall be reserved for peaceful purposes. 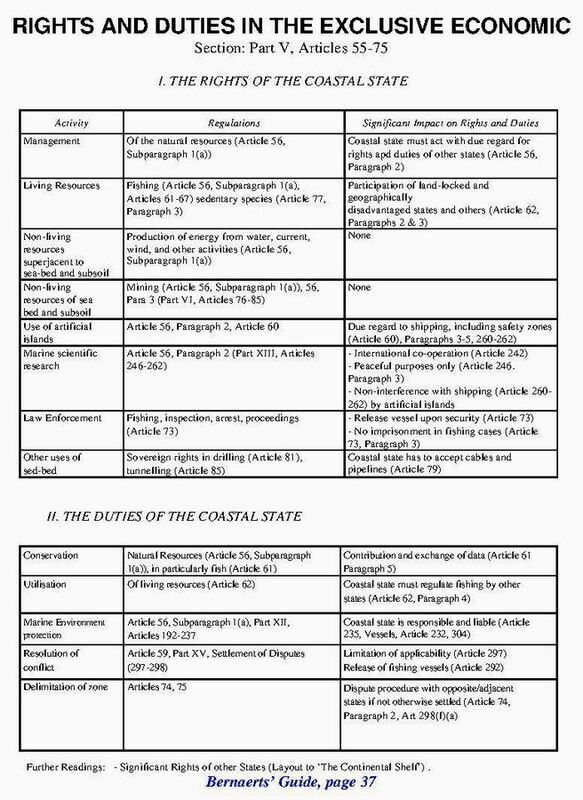 The coastal state has the exclusive right to construct and to authorize and regulate the construction, operation, and use of artificial islands, installations, and structures, including jurisdiction in respect to customs, fiscal, health, safety, and immigration laws. Due care is to be given to navigation matters. Conflicts arising from the failure of the Convention to attribute rights or jurisdiction to a coastal state or to designate areas as being governed by the "freedom of the seas" are to be solved on the basis of equity and in the light of all the relevant circumstances, bearing in mind that matters not regulated by this Convention continue to be governed by rules and principles of general international law But the common uses of the ocean (navigation, overflight, laying of cables) are always subject to compulsory dispute settlement.